For a limited time only buy a Gift Card for $100 or more and Receive 20% Off The Gift Cards Amount. 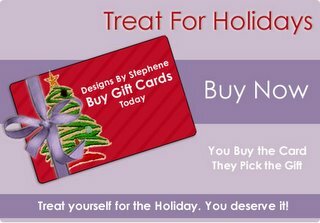 Gift Cards are an opportunity to purchase gifts for yourselves, friends or family at a discount for the Holidays. This insures the Person you are buying for can get the Gift they want. All Gift Cards will be mailed to you Via DHL and will take 3-4 Business Days unless you purchase expedited shipping. Treat Yourself This Holiday Season to a 20% Discount! Shop for 7 Diamond Jeans, 7 For All Mankind, Accessories, AG Jeans, Big Star Jeans, Blue Cult Jeans, Bomber Sunglasses, C and C California, Chick By Nicky Hilton, Chick Couture, Chip & Pepper Jeans, Ed Hardy Caps, Ed Hardy Pullovers, Ed Hardy Tees, Hanky Panky, Havaianas Flip-flops, Hollywood Tape, Hudson Jeans, Gottex Swimwear, J Brand Jeans, James Jeans, Joe's Jeans, Junk Food Tees, Le Tigre Shirts, Miss Oops, Nicky Hilton Beverly Hills, Ranahan Jeans, Splendid Tees, TakeOuts/Low Beams, THS Tees, True Religion Jeans, Trunk Ltd Tees, Vitamin A Swimwear. Click HERE for full details.